Marathi’s first Underwater song in Premay Namah! Around Valentine’s Day a lot of romantic films get released. One such love story is in the offing in the form of Premay Namah! As the name suggests, though it’s a love story, it’s treatment in all the departments viz. story, direction, music, locations etc., is different than run of the mills love stories. In the history of Marathi Film industry the makers of the film have shot a romantic song Underwater. There’s another speciality connected to the film. Bollywood invariably launches a game of movie titles of big stars (e.g. Shahrukh Khan-Fan, Don, Hrithik Roshan-Krishh, Salman Khan-Sultan, Aamir Khan-Dangal, Rajnikant-Kabali etc.). 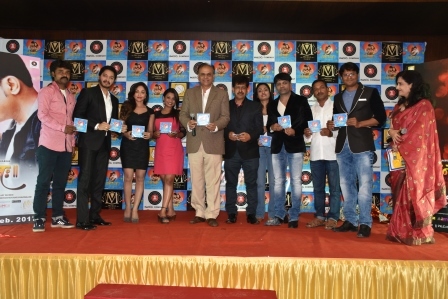 Likewise and without lagging behind this marathi film producer Uttam Chorade has got developed a game in the film’s name and ‘Premay Namah App’ got launched alongside film’s music which surely will be lapped up by the young filmgoers. Underwater filming is a tough job. But the film’s team have put in no-stones-unturned efforts while filming this first-of-it’s-kind-in-Marathi-film song. Premay Namah’s romantic lead pair Devendra Choughule and Rupali Krishnarao have put in great efforts for this song. Other crew members were underwater wearing oxygen masks but they did not have that liberty or privilege. They practised, under the guidance of experienced swimming instructors, about holding breath underwater for longer duration. They used special breathing techniques while shooting underwater song keeping in mind about the camera angles, romantic expressions, beats and lyrics of the song, director’s instructions etc.. They were lauded by the whole team for the daring and professionalism they showed while completing the under-the-sea shoot, without any frowns while meticulously following choreographer’s and director’s instructions, of this novel underwater song. ‘Zalo Bebhaan Mi’ song has turned out more beautiful because of the excellent camera-work by DOP Dhanaji Yamkar. Producer Uttam Chorade has used high quality VFX in post production so as to give viewers a treat in the form of underwater-romance which is filmed at locations in Ramoji Film City in Hyderabad and picturesque sea at Malvan in Maharashtra. Premay Namah is produced by Uttam Chorade whereas it’s been presented by Vijay Shinde and Mahesh Joke and is directed by Jagdish Watharkar and music composers being K Sandipkumar-Chadrashekhar Janawade. The film’s cast comprises of Devendra Choughule, Rupali Krishnarao, Prachi lalage, Surekha Kudchi, Prakash Dhotre, Bharat Daini, Gauri Magdum and Snehalraj. To witness Marathi’s first underwater song in Premay Namah, please visit theatre near you on 24th February 2017.